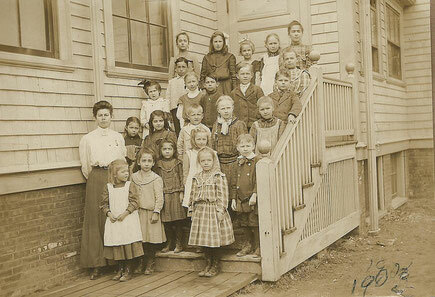 Find downloadable digital versions of the old photos in our library archive. Three former Directors of Whelden Memorial Library, standing with our newest one. L-R: Jane Merritt, Lexa Crane, Victoria Allard, Kathy Swetish. Martha Lee Whelden, a West Barnstable school teacher in the 1880s, was renowned for encouraging good reading by her students. Her friend, Mrs. George Linder, was so impressed that she donated two red bookcases and books to the grammar school. A village library had begun. In 1897, the "library" was transferred to a small room in the new "Otis Hall" nearby. Linder Library Association was formed in 1899 and the collection grew until 1905, when a separate building was constructed on town-owned land; the Lombard property. Volunteer stone masons and laborers constructed the building of stone to the window sills. In 1923, the Trustees renamed the library "Whelden Memorial Library" after a receipt of a large bequest upon the deaths of Miss Martha Whelden and her sisters. In 1968 and 1989, additions were put on each side of the original one-room building, creating a "C" shape. There have been eight library directors since the 1890s: Mrs. George Fish, Miss Carrie Bursley, Mrs. Harold (Gladys) Weekes (who served for 33 years), Mrs. Norman (Helen) Cahoon, Natalie Lowell, Jane Merritt, Lexa Crane, Kathleen Swetish, and currently, Victoria Allard. Whelden Memorial Library is incorporated as a non-profit institution. It is governed by eight trustees and four officers.